How you do something matters!! As teachers we have to be constantly thinking. How we present matter, the words we use, how we build a collaborative culture of trust in our classroom. Our tasks are challenging. We have to make students do something they don’t necessarily want to do, learn, work and grow. Teachers don’t dole out incentives, such as money or promotions. Teachers don’t have the power to fire the students when they don’t preform well, We have to frame tasks in ways that give students the feeling of control and choice. while maintaining control, guiding towards learning target. Highly effective teachers spend weeks planning for the creation of their classroom environment. Procedures and policies help build the classroom atmosphere. Students learn about teacher expectations through these procedures. Routines are established and students gain clear expectations for their behaviors. Classrooms spend weeks at the start of the school year working on building this trusting atmosphere. As students begin to show trust, teachers focus more on academic lesson and less on modeling procedures to establish trust. At this point teachers need to be careful. One small slip up, one unplanned moment, second of anger all the hard work can be undone. Yelling in anger, not following classroom procedures, showing favoritism are all mistakes that can cause a classroom to fall apart. It has happened to me. You might not notice right away. You might catch yourself and think, well my students did not notice, but they always do. First you won’t notice the culture changing, it is hidden. Slowly students will test the boundaries and challenge the norms. If you are not careful, all control will be lost. Best solution is to acknowledge the slip up, apologize and move back to the norms. Trying to cover up poor choices and lack of planning is only modeling behaviors we don’t want in students. For me the trusting collaborative culture in the classroom is important enough for me to admit my mistakes. Does this type of modeling happen everywhere? I wish companies modeled more of the citizenship and collaboration expectations that schools help set. Many businesses including schools don’t seem to value these behaviors in their cultures. Bosses are often depicted as shouting orders, stealing ideas and demeaning subordinates. Our students have grown up in a culture where their parents are often grumbling about work and their working conditions. Many will argue that is the nature of work. I would argue that times are a changing. Many of the new corporate giants like Google, Quicken Loans, and Facebook are working hard to make their collaborative culture of trust a key to their success. Employees like working for corporations that follow their procedures, model trust and collaboration and apologize for hiccups along the way. School districts need to follow the model their teachers present in the classroom and corporate success stories have used to grow. Too often, districts uphold the stereotypical boss imagine. Shouting orders from on high, without spending time to develop relationships, build trust and give staff guided ownership in the necessary changes. Leaders often forget how to lead, once they have climb into their position of power. It is often how a change is presented that gains acceptance, than the change itself. 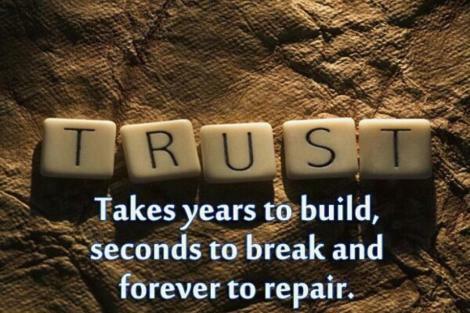 Even the most necessary change, can break a collaborative trusting culture if presented in the wrong manner. How we teach, lead, DO anything matters because that is how we are perceived! And perception is everything!! Previous Post How do kids grow?